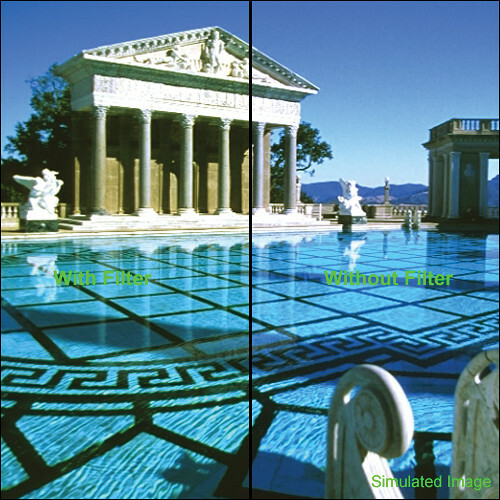 The 28mm 81A (KR3) Filter from Heliopan controls the bluish coloration that affects daylight film. Even though the human eye automatically adjusts to various lighting conditions, film does not. Irrespective of the light source, a white sheet of paper will always "appear" white to the human eye. However, when photographed under various lighting sources, the paper will reproduce a representation of the light it was shot under. An 81A filter will allow you to correct for this white balancing problem when you wish to reduce the color temperature of the shot and bring your tones back to a more acceptable level. It's Autumn. The clouds are low hanging and the sky is "patchy blue". You've gone for a ride upstate to the mountains and the light in open shade is bluish. A photo taken of your girlfriend with daylight balanced film leaning against the side of a barn will yield bluish tones that are neither natural or flattering. An 81A filter will replace some of the yellow missing from the image and bring her skin tones back to a more appealing level. The cloudier the day, the warmer the filter you require to eliminate the blue tint often found on such days. An 81A can also be used with electronic flash to reduce the amount of blue generated by the flash.This filter is also useful when shooting at higher elevations where the light tends to run towards the blue end of the spectrum. Heliopan filters are made to exacting standards and with Schott glass - world recognized as a high-quality glass used in the world's best filters. The filter mount is thinner than traditional mounts but will still allow you to stack another filter on top as well as accept a lens cap. The filter features Heliopan's hard coating that not only produces a stronger filter surface but offers more protection to the front element of your lens. The filter ring is made from brass yielding a stronger product. Brass filter rings are also less prone to jamming. In addition, the seal between the glass and filter ring is exceptionally strong giving the filter added strength and durability.